Health conscious consumers are on the rise, whether it be us or someone we know well. I can definitely say that I am one of those people. After being diagnosed with Celiac disease (an autoimmune disease where the body attacks the lining of the small intestine upon consumption of gluten-containing foods) about a year ago, I went through a complete diet shift. I had to read labels on everything I bought, and I became hyperaware of food labels, the power of labeling, and how misleading these labels can be. We have become accustomed to certain buzz words, particularly “Gluten Free,” but also “Organic.” These words carry immense purchasing power, which is why they’re becoming so widespread. Although I’m pleased that finding certified gluten free foods is extremely easy, I find that food labels with these buzz words can be misleading for consumers who are trying to be healthier. Many people would feel better about eating an organic or gluten free spinoff of Cocoa-Puffs than the original, even if it is still filled with sugar. Science Daily magazine calls this the “Health Halo Effect.” Essentially, more companies are altering products so they can include these labels because purchasing trends show that the products will sell. The graph below from the United States Department of Agriculture shows the growing trend in organic foods over the past nine years. 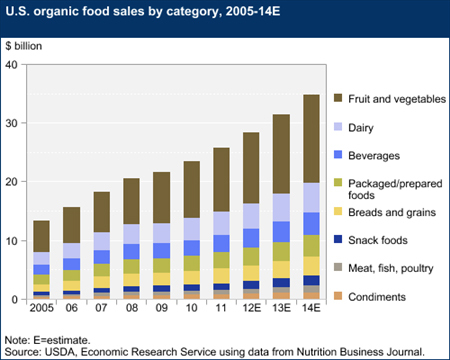 Every category of organic foods is growing, including packaged foods and snacks. Consumers must be aware of marketing strategies and their perceptions of these labels. The quest for better health cannot stop at the mere label of “organic” or “gluten free.” It is important for consumers to be aware of the ingredients in their foods, regardless of if they are organic, contain wheat, or not. The “Health Halo Effect” is proof that perceptions drive behaviors. I can say from experience that gluten free packaged foods often contain higher amounts of sugars to compensate for taste and are often filled with wheat replacements that are no healthier than wheat. Consumers must realize that a truly healthy diet requires more than a buzzword on the box. I am in my fourth year at the Ohio State University studying accounting. I am very interested in the food industry and learning about food labels, production, and growing techniques in the US. Al Gore gained notable recognition during his service as vice-president to then President Bill Clinton in 1993 when he started speaking out against global warming and human impact on the environment. Gore was a proponent of environmental protection well before his service under Clinton but it was in this time and during his election cycle against George Bush in the 90s that he gained the most notoriety and fame for being the face of the Green Movement. Many remember Al Gore’s speeches telling us to cut down on carbon emissions, reducing our water intake, and using less energy all together. Admirable individuals believed this and changed their life around his lessons in the selfless act to save the environment. Fellows like Kip Anderson decided to get ride of their car and bike to work, they started making a conscious effort to turn off the water during teeth brushing, and turning the lights off when they leave the room. The sad thing is after this large Green Movement the results were not only dissatisfying but they went in the opposite direction as expected. People who were convinced they were doing the right thing were left with a smack to the face when the UN released new data showing greenhouse gasses in the atmosphere rising even after changing their day-to-day lives entirely. The “information” Will is referring to is the many studies and journal submissions conducted by the UN looking at the major proponents of pollution and greenhouse gas culprits. So who are they? Well, dare I be so bold and tell you that the ones destroying the planet are putting the food on your table making you a co-conspirator in our own demise > Animal Agriculture for meat. I encourage you to take the red pill and jump into the new Green Revolution; I promise you won’t like what I ask of you. There has been ongoing litigation between farmers and GMO companies over seeds and patents. The main debate has been surrounding genetic pollination & how much patent protection, if any, should be granted to GMO companies, and whether the patent rights have been utilized rightfully against farmers. Producers who do not knowingly plant any form of GMO seed might still have crops yield positive tests, if the crops are contaminated by GMO pollen which drifted in from neighboring fields. Such positive GMO tests might also result if the crop is otherwise “contaminated” with GMO seed after harvest or during shipping or processing. The GMO debate provides several examples of the significance of controlling terms and language. Under traditional pesticide drift law, if the judge views the product as a pesticide then the person using it will be responsible and strictly liable for its movement off the property. If it is seen as a natural product — then the fact the crop expressed itself all over the neighbor’s field may not result in liability. David versus Monsanto, the story of a Canadian farmer whose land was contaminated by proprietary GMO plants from Monsanto, a big biotechnology company, and was sued by Monsanto for infringement. Schmeiser infringed on Monsanto’s patents because he did not obtain a license for his replanting of the harvested contaminated seeds. The US Supreme Court case Bowman v. Monsanto dealt with an alternative case where the farmer had proper license to replant the GMO harvest seeds. They introduced a legal doctrine called patent exhaustion, which states that patent rights are applied only to the first sale. Any subsequent owner of a patented article other than the original seller may use or sell the thing without patent restriction. The purpose of the patent system is to give inventors a period of exclusivity for commercial development of products, encouraging innovation. Utility and plant patents have a patent term of 20 years from the initial filing, so GMO patents protect a marketed product for about 15 to 20 years after the time of product development. Utility patents, offers a different type of patent with more stringent requirements on the description of the invention. It can be seen by this and many other legal loopholes that the infringement laws are not so clearly differentiable. In this post, I wanted to discuss the topic of invasive plants and how they have such a large impact on our society today. If you asked a variety of people what an invasive plant is and its importance a large part would probably not know exactly what it is and the damages it has on us. A great example of an invasive species is the kudzu vine that is well known in the southern parts of the states. The very fast-growing vine covers other plant and land to the point where it is unrecognizable. There is not much control for this plant. Its grows so fast and is aggressive that it needs a lot of maintenance. When the invasive plants like kudzu is not watched and contained they have the ability to over power and push out native species. When this happens not only are the plants are effected but the ecosystem they live in is also hurt. When they plants are gone the insects that feed on them will start to increase so on and so forth. Eventually the ecosystem in gone as well. What makes it possible for plants like kudzu to become invasive is that when they are introduced into a new ecosystem is that they have no natural predators. When there are no predators this is when the plants have no method to control their growth. The invasive plants will keep continuing to grow and reproduce until something stops and controls it. I think it is very important to educate others about invasive plants and how much it affects us. When educated we think about our actions and how introducing a plant where It is not native might not have a positive outcome.